Today we've deployed a new version of our core matrix routines which solve the hundreds to thousands of simultaneous differential equations generated from a single schematic. These updates include both algorithmic and implementation changes in the equation optimizer and sparse matrix LU factorization that power CircuitLab's analog simulations. Across our internal simulation testbench, we've measured performance gains of 30% to >100% on individual circuits. While the degree of speedup will vary greatly from case to case, we've clocked our total internal benchmark to be approximately ~80% faster. 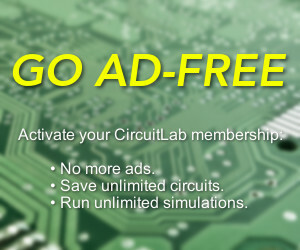 Faster simulations allow our academic, hobbyist, and professional users to iterate faster, and this performance boost makes CircuitLab a useful tool for a wider range of design and analysis problems. As usual, CircuitLab users can immediately take advantage of these improvements by launching a new editor session, with no software installation necessary. Lower runtimes are better, indicating that the tests finished faster. We've normalized all benchmark run times against the current winner, Google Chrome, with Mozilla Firefox close behind. As the benchmark data makes clear, we significantly improved performance across all browsers. Coupled with last month's simulator feature improvements, these performance enhancements continue to improve the capabilities of the CircuitLab toolset from all angles. This is a buck converter, which allows a high voltage / low current power source to efficiently drive a lower voltage / higher current load. It does this by storing and discharging energy in an inductor in a controlled fashion. This type of switching power supply is found in many places in our everyday lives, delivering clean low-voltage power to a laptop's CPU, or in the LED-based solid state lighting solutions that are now making their way into homes and businesses. In CircuitLab, we can model a buck converter quickly, and then easily test different components or values or configurations. With our old matrix library, this circuit took about 26.7 seconds to simulate, but with our new update, it simulates in just 12.4 seconds -- that's a 115% speedup! Faster simulation time means we can generate results and try another idea more rapidly: Smaller inductor? Synchronous rectification? Faster switching frequency? Effect of inductor ESR? Closed loop feedback control? These are the questions that power electronics designers explore as they strive to make their designs better in every dimension: more efficient, less electrical noise, smaller, more robust to input and output conditions, more robust to component variations, cheaper... By coupling an easy-to-use interface with a faster simulation engine, designers can formulate and test hypotheses, make improvements, and ship better designs faster. * Browser versions used in this test include: Google Chrome 20.0.1132.57, Mozilla Firefox 14.0.1, Apple Safari 5.1.7, and Opera 12.0. Why not IE9/IE10? The only reason I can think off is that you guys are not running Windows, or else they are excellent alternatives, and no, I am writing this comment using Google Chrome. I am no fanboy of MSFT. I want to point out that we aren't going out of our way to actively block or IE users or use other vendor-specific features, and we simply display a "Browser compatibility warning" message. It's just that IE doesn't handle the same code that our officially supported platforms (Chrome/Firefox) run just fine. I was wondering why CircuitLab was suddenly running so much faster on my Firefox. I love this web resource, guys. This site is a beautiful piece of work. Nice update!! I am using Circuit Lab in my classes. Besides making simulations in class, I ask my students to make homework simulations. They don't need to install any software, I can share my circuits with them, and they have access to lots of other people's circuits. It is a really great software! Congratulations! Seems to run great in Windows 8 with IE10! Your simulation graphs are sooooo ugly, man.